Roger takes a look at the financial numbers from the UK, Europe and across the globe and concludes that “This is a very good time for SME owners to invest in what they believe in: themselves and their key staff.” This article has been edited from Roger’s Economic Update for August for the Bottom Line newsletter with his support. The big hope two years ago was that investment spending and net exports would grow to offset the decline in private consumption. This is not happening. There will be no recovery in consumption spending until the following graph reverses. 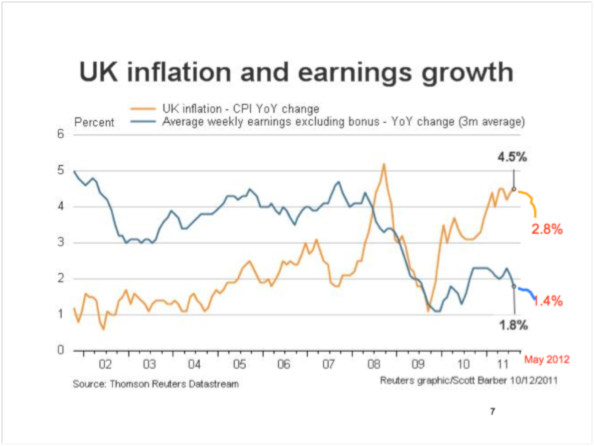 Although CPI has recently dropped to 2.8% ( May) weekly earnings have fallen back to 1.4%. So real incomes continue to fall. This is having a marked impact on the pattern of sales for retailers. We are shopping for food more frequently and buying less each time ( hence the success of convenience stores). And volumes rise after pay day then steadily fall away until the next pay day. The UK growth rate will not pick up until earnings are growing at least 1.5% above inflation. This years’ global weather has devastated farming. The worst drought since 1956 in the US midwest and the wettest summer on record in the UK will cause significant increases in the price of food this Autumn. Exchange rates, inflation and interest rates. Sterling will weaken slowly to $1.50 by the end of this year. It will gyrate against the Euro, but 1.27 is the correct rate based on financial fundamentals. The Aussie dollar and the Brazilian real will both weaken. The Rnb is likely to stay where it is against the dollar. Inflation in the UK will not go below 2.3% and is likely to pick up to 3% over the next 12 months. In Euroland inflation will pick up as the Euro weakens against the dollar. Interest rates: unchanged. The G20 is a club for the world’s largest economies. 55% of the current membership have historically defaulted on their debt. Spain has on 18 separate occasions since 1550, Greece 5 times since 1820. In the light of history it appears that the decision by the Basel Group to treat Sovereign Debt as risk free was a big mistake. It is this which enabled undercapitalised French and German banks to lend massively to Clubmed members of the Euro. With low interest rates, easy credit, asset price inflation and no exchange rate risk, the incentive to restructure pensions, subsidies and the retirement age did not exist. There was no incentive to be like Germany. And so something will have to give. The ballot box will create the inevitable: it is just not possible for Greece to meet its obligations, they have already asked for an extension of the bailout plan to 2017 and the new Finance Minister is under intense pressure to renegotiate the terms. The break up the Euro in inevitable, the North will not behave like the South and vice versa. Greece first by the end of August. Then in 2 years Spain and Portugal. Italy to follow in year 3. By 2017 there will be a Nordic Euro, including France. This will be driven by the ballot box, with the Clubmed voters choosing less austerity and the Nordic voters choosing less financial support for the South. Watch for the behaviour of Finland they could be the first Nordic country to leave. It’s rapidly slowing down. The most recent purchasing managers index is at 50 which is the tipping point. Western economic policy is tightish fiscal policy (with Governments trying to limit their borrowing) mixed with extremely loose monetary policy. And each country is exhorting it’s industry to export more. Very loose Monetary policy is like pushing on a piece of string. It has prevented a global depression but that is it. The latest news from China is that the demand for commodities and machinery has not been about end use. Anything with a monetary value such as commodities is being used collateral to secure loans which are then fed into the shadow banking system for higher returns. It follows that if commodity prices collapse so will the collateral. This will create a financial crisis, forced stock liquidations and further falls in price . Be aware that China is becoming more unstable. The Australian Dollar and Brazilian Real will weaken as a consequence of a commodity price slump. The latest figures from China suggest that at 7.3% real growth the economy is at the target level of growth set in the new 5 year plan. As always the GDP numbers are a political statement. The consumption of electricity has not increased for a year now. This suggests much lower growth. GDP and the demand for electricity move in line. For example UK electricity demand adjusted for the weather (!) is down 2% over the past year, this is almost in line with our economic output. As forecast the oil price is at the minimum target price of $100 and it will not fall much below this for long. NB. I now expect a mild global recession next year. Here is why. The Euro debt problem can only solved by write down, inflation, more debt or growth. It is infecting boardrooms around the world. Finance directors will hoard even more cash. QE doesn’t increase the capital base of a bank. Writedowns reduce it and there will be a growing number of these. As the velocity of global money falls so will global GDP. Is there a solution? Yes. In Europe the slate is wiped clean as countries agree to write down what they are owed. Germany would need to write down about 600Bn Euro, but the total writedown would be around 1.2 Trillion. What does all this mean if you are running a business? The Economic conditions we can expect for the next 3 years will really sort out the weaker players, and give growth opportunities for the strong. Western economies are beginning to make some significant transitions with less reliance on financial services and more focus on high end, innovation led products and services. This is a very good time for SME owners to invest in what they believe in: themselves and their key staff. In strategic terms the key words are focus and engagement. Focus on the customers whose needs fit tightest with your distinctive capability, engage with them to test and ensure that you both agree what the value drivers are and how they might be changing. Also engage with your employees, communicate by listening, keep asking them to tell you how they think the product or services you produce can be more compelling for the customer. Be patient in building your distinctiveness. The value of your business will be increasingly determined by it’s reputation more than the physical assets it owns. It is now holiday time. A time to reflect, do something different, renergise and get ready for a very turbulent Autumn. There will be another Euro crisis in late September. Roger Martin-Fagg is an Economist. He teaches all aspect of applied economics and strategy on Executive and Corporate programmes at a number of Business Schools. His clients have included Lloyds TSB Group, BAA, EDS, Greenalls, BT, Transco, ABB Alstom Power and Powergen, for whom he designed, manages and taught strategic management programmes. He has also worked with Mobil Oil, Total Oil, Thames Water, BAA and Taylor Wimpey, helping senior managers read and interpret the trading environment. Roger has facilitated main board directors and senior managers through a strategic review process, which he continuously updates. In this way he has worked for Taylor Wimpey, Experian, Brent International, Marshall Cavendish, Elga Pure Water, DHL Czech Republic, Marks and Spencer, Tribal, and Technicolor. He also regularly gives economic updates to groups of Chief Executives of SME’s at seminars round the UK. His book ‘Making Sense of the Economy’ is in its third reprint. His hobbies are rowing and playing piano in a Blues Band. ← On your marks, get set, grow! Prepare for Recovery.